It’s not goodbye, it’s see you later. The final day at Pueblo Inglés was bitter sweet. Though we were all proud of the Spaniards for completing 100 hours of English speaking over eight days, it was very difficult to leave all of our new friends and resume our regular lives. During our closing ceremony we were each awarded a certificate either for volunteering, or for completing the second language program and had the opportunity to say a few closing words to our new friends. A group of us decided to extend our having to say goodbye and took three very full cars (there was some luggage Tetris played…European cars are small) out to the historic city of Salamanca. The city is absolutely stunning, built almost entirely out of engraved sandstone. Upon arrival our little group went out in search of a frog…led by one of the Spaniards. 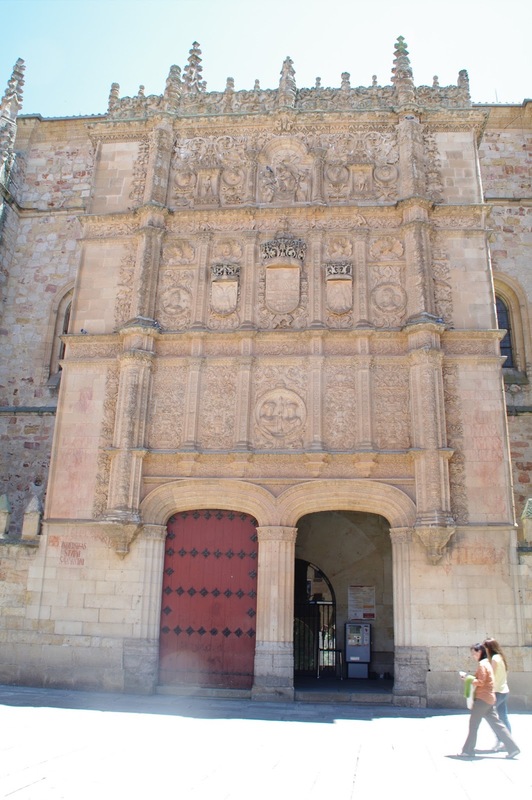 An engraved wall in the centre of the city contains a famous frog, which one is meant to find whilst in Salamanca. After a lengthy search none of us could locate the amphibian. It is actually quite small and bears little resemblance to a frog due deterioration by time and weather. Apart from the frog Salamanca is home to one of the worlds most beautiful libraries, located in the University of Salamanca- Spain’s oldest university and the fourth oldest European university still in use. If you’ve followed my blog you may have noticed that libraries are kind of my thing and this one happens to be on my bucket list. Unfortunately I didn’t get to see the library and only learned once I returned home that the wall we were looking at was actually part of the university. I’m sad to say I regret not seeing it…though I suppose it’s an excuse to return one day! After asking for a little help locating the frog from a local we met up with a few more friends in Salamanca’s main square for tapas and beer. Before heading back to Madrid we said goodbye to a few who were heading to Barcelona and others who we wouldn’t see again (at least on this trip). The drive back to Madrid was a scenic route through the countryside and took about two to three hours. Though we all exchanged numbers and emails and are still keeping in touch via a WhatsApp group it’s very difficult to say goodbye to friends and not know when you’ll see them next. I’m quite sad thinking about it now. I made my way out to UHostels, where I was spending the night by late afternoon. Due to my having to catch a flight before 9am the next day I basically just went to sleep and thus didn’t see much of the hostel, though it looked quite nice and had a beautiful view. 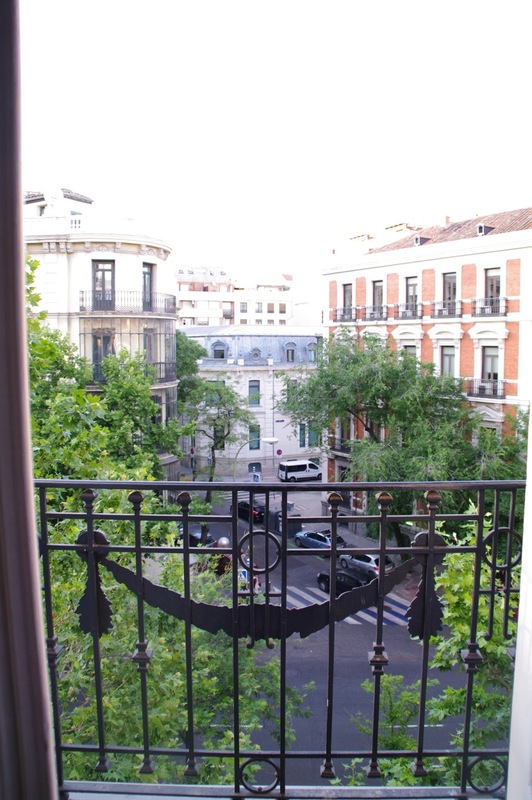 It is located in a very nice area of Madrid and though I would have loved to see more of the city I was exhausted and couldn’t stay awake long after I checked in. I’ve taken away so much from the Pueblo Inglés program. Not the least of which being all of the amazing people, whom I hope will remain lifelong friends. I’ve also, unexpectedly I might add, learned much about myself and grew as a person. I initially applied for the program with the selfish interest of visiting Spain and having somewhere to stay, not considering how much more I could gain from the experience. As someone who can be naturally quite introverted I’ve actually found myself much more sociable and taking an interest in meeting and speaking with new people since leaving the program. I’ve also become more appreciative of the benefits of having a second language. Though I was enrolled in French immersion through elementary school I haven’t spoken much since grade nine French class. In the past month I’ve actually resolved to improve my French and perhaps learn a third language at some point in the future. In fact, I may take a Spanish course through Diverbo!